Riding a motorcycle can be a fun and exciting experience. However, it takes a lot of time and practice to be a confident and experienced driver. Read on for some helpful tips that will help you enjoy riding your motorcycle safely. How old do you have to be to drive a motorcycle? The minimum age to drive a motorcycle varies from state to state, but in most states in the US you can apply for a motorcycle license at the same age you can drive a car. Check with your local Department of Motor Vehicles Office (DMV) for information about the laws in your state. How do you get a motorcycle license? Depending on the state you live in, you may have to pass a written learner’s permit exam before you can get your license. The exam will test your knowledge of motorcycle safety and traffic rules and regulations. Check with your local DMV before you go to find out what kind of documentation you need to bring with you (birth certificate, identification card, etc.) and whether or not there are fees involved. At the time of your permit test, you may also have to pass a vision exam; again, this depends on which state you live in. To obtain a motorcycle license, you’ll have to pass a road test. Before your test, call your local DMV to find out exactly what you need to bring with you. In some states you may have the option of taking a motorcycle training course for licensing and the road test would be waived. What types of classes are offered for beginners? One of the best and easiest ways to learn how to ride (and to ride safely) is by taking a motorcycle beginner’s safety course. Taking this course will give you a chance to ride your bike in a supervised setting before traveling on the open road. Beginner rider courses are designed for beginner riders with little or no previous motorcycle experience. Students learn about different types of motorcycles and their controls, and then begin developing and practicing the mental and motor skills necessary for safe riding. Some insurance companies also have lower rates for those who complete a motorcycle training, so check with your insurance company to see if this is a possibility for you. How do motorcycle laws work? Motorcycle laws vary from state to state, so the best thing to do is to become familiar with the laws in your state and any other states you may be traveling to. For example, most states don’t allow drivers to carry a passenger until they have a license, and most states require drivers to wear a helmet. A word about helmets: One of the advantages of wearing a full-faced helmet is that it protects from you from rocks or debris that could hit your face while riding or potentially cause an accident. The main advantage of wearing helmets is that it can protect you in case of an accident and prevent serious problems, including head trauma and brain injury. Regardless of state requirements, the medical recommendation is always to wear a helmet when riding. 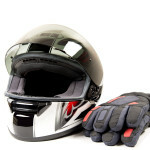 What should I wear to protect myself while driving a motorcycle? If you’re carrying a passenger, he or she should also wear proper riding gear. Do motorcyclists follow different traffic rules? No. Motorcyclists must follow the same rules of the road as anyone else with a driver’s license. Riders should always use a turn signal when turning (don’t forget to cancel them after the turn), pass on the appropriate side, and follow the speed limit. Always ride with caution when traveling near other motor vehicles; it can be difficult for them to see you. When you’re driving a motorcycle (as opposed to a car), you’re not protected by a metal cage. Motorcycles are smaller in size and have fewer lights than cars, so they’re harder to see. You have to be much more protective of yourself, because other people are going to be LESS aware of your safety than they would of other cars (because they can’t see you as well). A motorcycle is less stable on the road than a car is. Wet pavement and gravel roads are much more dangerous for a motorcycle, especially while making turns. Choose to ride at safe speeds, look well ahead and don’t tailgate, and never drink and ride. Are there any rules about riding a motorcycle in bad weather? Although there are no set rules, weather plays a big role in choosing when or when not to ride a motorcycle. If it’s raining or snowing riding a motorcycle can be dangerous. Rain or snow can make it difficult (or even impossible) to see ahead of you and traveling on roads that are wet and slippery can be extremely challenging even for experienced riders. Always check the weather forecast before you get on your motorcycle. The most important factors involved with motorcycle safety are your knowledge, experience, training, and attitude, along with wearing the proper riding gear and helmet. Check in with your local DMV for upcoming courses to improve your riding skills. Remember, Rider Responsibility starts with the Rider.